DevOps is not the end! The purpose of this blog post series is to explain what I use to do in my work as DevOps to secure each part of application development and infrastructure. Traditional security operates from the position that once a system has been designed, its security defects can then be determined by security staff and corrected by business operators before the system is released. Unfortunately, the belief that security must operate this way is flawed with the introduction of iteration and has since created inherent risks within the system because business decisions need to be balanced inline and addressed at the speed of business. DevOps means a lot of different things to different people but basically, it’s concept, a culture, the reconciliation of operations and development engineers participating together in the entire service lifecycle, from design through the development process to production support. 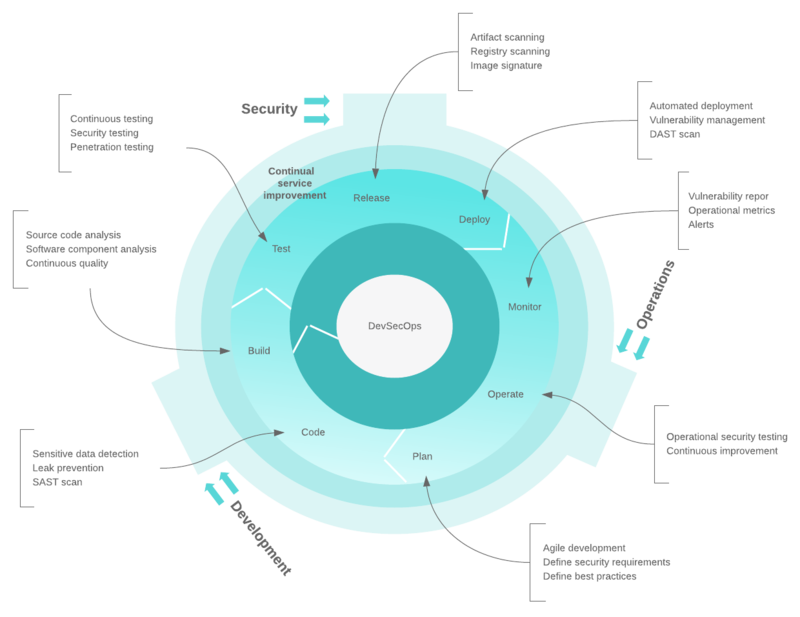 By design, DevOps is applying agile and lean approaches to operations work and manage collaboration between development and operations staff throughout all stages of the development lifecycle when creating and operating a service. DevOps is also characterized by operations staff making use many of the same techniques as developers for their systems work. Those techniques can range from using source control to testing to participating in an Agile development process. C for Culture: Unify teams and create easy communication and collaboration channels. A for Automation: Critical part of the movement to streamline operations and configurations to be more effective. L for Lean: Deliver value to the customer and to continuously improve the ability to deliver value by removing waste activities. M for Measure: Continuously improve through experimentation, measurement, learning, and adjustements in iterative lifecycle. Measure everything all the time and report. S for Share: Collaboration is the key, share success and failure. An organization must lean to trust their team members with information and decision making authority in their respective areas. The idea is to develop a culture of automation to gain agility in the management of each part of the application lifecycle. But it’s not a end in itself. DevOps is not the end of something, it’s just a transition to a fully automated and secured infrastructure. That’s why today the DevOps word is updated with some other acronym. DevSecOps is part of it. DevSecOps is an evolution of the DevOps culture. They are tightly coupled. at speed and scale to those who hold the highest level of context without sacrificing the safety required. This means that with the change impacted by the DevOps culture, traditional security is no longer an option. The mindset established by DevSecOps lends itself to a cooperative system whereby business operators are supplied with tools and processes that help with security decision making along with security staff that enable use and tuning for these tools. In this way, the value that DevSecOps engineers supply to the system is an ability to continuously monitor, attack and determine defects before non-cooperative attackers might discover them. This allows for all, including security staff, within the business ecosystem to contribute to iterative value creation without the additional pain of attempting to acquire severely scarce security practitioners to be added to DevOps teams. Developing security as code provide insights directly to developers, and generally favor iteration over trying to always come up with the best answer before a deployment. DevOps and DevSecOps values give you the ability to add agility in the security management. Each concept allow you to manage security by iteration to quickly patch a tool or a service independently of the ecosystem. Some folks thinks that DevOps means that developers and operations are taking over security and doing it themselves. Part of that is true and part of it is not. Developers and operation teams do not have to define their security policy, they have to work with the security team to create policies and take care of it as soon as possible in their projects. DevSecOps should be seen as an evolution of the management of security infrastructure. The evolution of microservice, cloud, orchestration platforms ask to revise the old security practices to adjust this concept on the life cycle of current infrastructures. Development, operations and security teams must work together to to define good practices to put in place. This will necessarily go through the deployment of management tools (monitoring, logging, SIEM, etc.) but also by the understanding of tools by each collaborators and the involvement of each party in putting security concepts into practice. 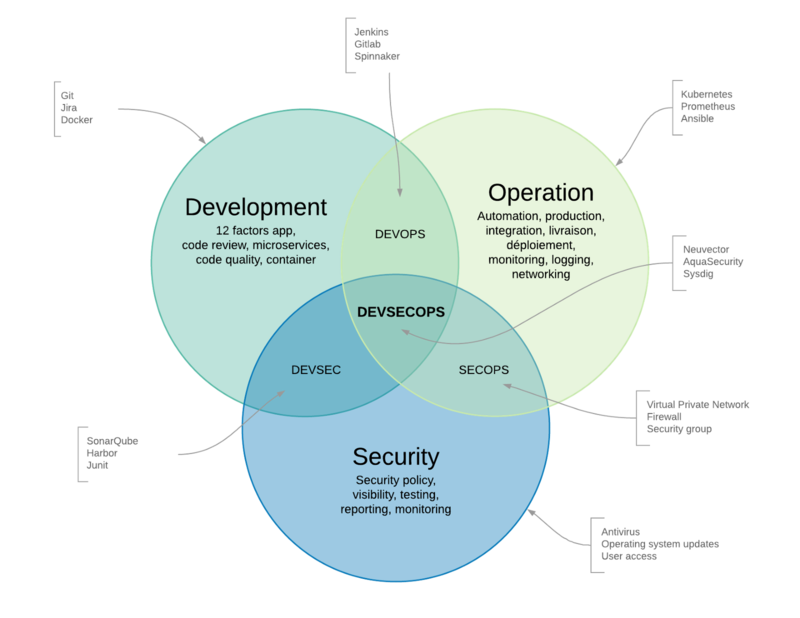 In my next blog post, I’m gonna give more details on how DevSecOps can be implemented, his relation with development and operation teams and the benefits for each part.